What is Nitrous Oxide, or Laughing Gas? Nitrous oxide (N2O), also known as “laughing gas” is a commonly used sedative which can help you stay calm and comfortable while undergoing dental treatments. 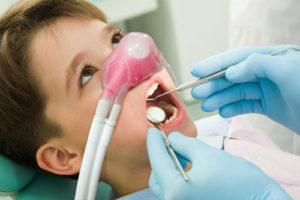 Laughing gas can be administered to healthy patients through a breathing mask and inhaled by the patient throughout the treatment. When you are given laughing gas, you may fall asleep or not remember what happened during your procedure. This can be a valuable benefit for those who find themselves very uncomfortable or afraid of undergoing necessary dental health treatments. The laughing gas starts to work very quickly. It can help relax an overly sensitive gag reflux. There are no side effects to your heart, lungs or other organs. The after-effects are minimal and shouldn’t disrupt the rest of your day. The intensity of the gas can be adjusted at any time based on your comfort. Who Can Be Treated with Laughing Gas? Nitrous oxide can be a beneficial option to people at many ages and with varying treatment needs, however, there are certain health conditions that might make you unfit to receive it. If any of the following conditions apply to you, you should consult your medical doctor before being administered nitrous oxide: first trimester of pregnancy, chronic obstructive pulmonary disease (COPD), emphysema, exotic chest problems, asthma, multiple sclerosis, a cold or any other respiratory challenges that impact ability to breath. If you’re not fit to receive nitrous oxide, your dentist may still have other options to help make you comfortable during necessary procedures. If you’re concerned about how you might react to the gas, you can ask your dentist for a short trial to see how you feel about it before proceeding. Before you arrive at the dentist’s office for your treatment using laughing gas you should eat lightly. When your dental professionals are ready to begin the procedure, you will be given a mask that will administer the nitrous oxide. The nitrous oxide will be colorless and odorless, and it should begin working soon after placing the mask on. Throughout your procedure, the dental team will be checking in with you to monitor your comfort levels and they can increase or lessen the levels of the nitrous oxide being inhaled at any time. When your procedure has been completed, you will be given oxygen through the mask for several minutes to remove any remaining nitrous oxide from your lungs. This will help you to regain alertness and avoid headaches. After your appointment, be cautious and follow your doctor’s recommendations on when you are able to return to any activities that require high alert levels. It is best to wait three hours after you have been administered laughing gas before eating a large meal. Are You Interested in Receiving Laughing Gas During Future Visits?